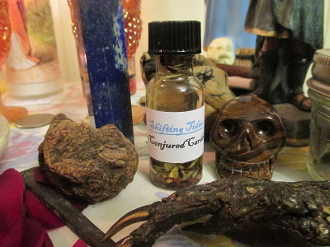 If you are seeking a change, a separation, a turnabout in your situation, try my Shifting Sands formula. If a few drops are added to a bowl of water in the home, it encourages a troublemaker to quietly and peacefully depart. If used as a perfume, it causes one to encounter new people, to have a chance at a better or different job, or for an opportunity to move or travel. This formula is wonderful for opportunity and to help ease new transitions.